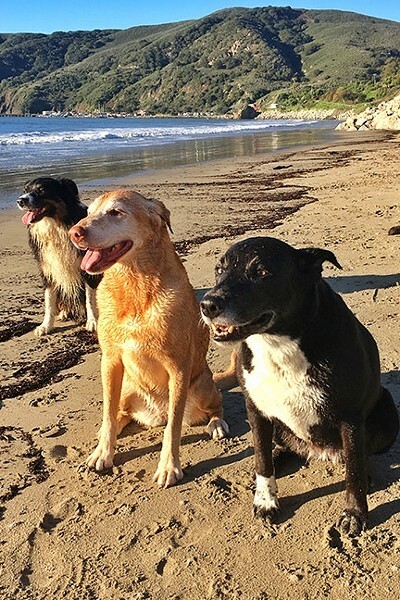 Doggone: Will dogs be banned from Port San Luis beaches? It’s 8 a.m. on Sunday, Jan. 29, and high tides have reduced Olde Port Beach to a thin ribbon of sand. Heavy surf has churned up thick, rubbery kelp and seaweed, and there’s quite a bit of trash littering the shoreline—a heavy rubber glove, a few empty beer bottles, a to-go container, various plastic bits, and even a couple doggy doo-doo bags that were used but never taken to the trash. You can tell by the bags’ weathered appearance they’ve been rolling in the surf at least since yesterday. It’s not uncommon to find a dog mess here or there that wasn’t picked up at all. THREE AMIGOS: Every weekend my three dogs—(left to right) Brody, Bella, and Moonleaf—hit Olde Port Beach for exercise and socialization. These dog messes and discarded bags may very well be the undoing of my dogs’, my wife’s, and my weekend ritual of coming to Olde Port Beach with our 16-ounce thermoses of coffee and walking up and down the beach to exercise our three dogs every Friday, Saturday, and Sunday morning. 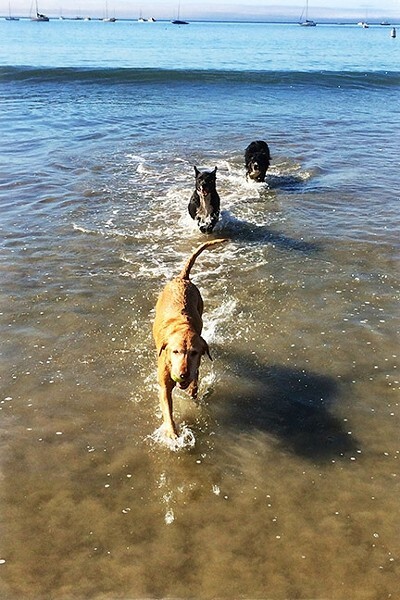 The Port San Luis Harbor District, which oversees the beaches from Avila to the lighthouse, is considering a dog ban or restricted off-leash hours at the beaches. Items that were up for discussion at the district’s January meeting included restricting hours, requiring leashes, or designating beaches dog free. Lighthouse and Fisherman’s beaches are both small and have become popular with kayakers. I’ve personally never taken my dogs to either, and we only go to Avila if the tide is so high it’s erased the Olde Port shoreline, as it did on Friday, Jan. 27. SWIM, RUN, FUN! : Olde Port Beach offers plenty of dog fun, and the riprap makes an effective barrier to corral the canines. I most value dog access to Olde Port, but I know dog owners regularly take advantage of Avila’s off-leash hours. No doubt the two smaller beaches have dog-owning regulars as well. The truth is, sometimes dogs poop in the ocean, just like seals, and dog owners can’t stop them. It’s also true that in all the excitement when multiple dogs are running around and playing, an owner might not notice that one of their dogs defecated. Those things are unfortunate, and we dog owners should be more vigilant—access to these beaches is a privilege. Most hiking trails and area lakes require leashes—if they allow dogs at all. At Olde Port Beach, dogs can run free, corralled by the erosion-preventing riprap that lines the road. The sheer joy these dogs feel is infectious! Every weekend I see many of the same familiar faces. I may not know the people’s names, but I know their dogs’ names, like the couple that has two young Vizslas named Cowboy and Sissy, or the guy who drives down from the North County with his boisterous female yellow labrador Harley, or the man who walks his lumbering gentle giant of a yellow lab named Abba, or the young couple with their tank-like English bulldog mix Lincoln, or the lady with the French bulldog Enzo and the fat pug King. 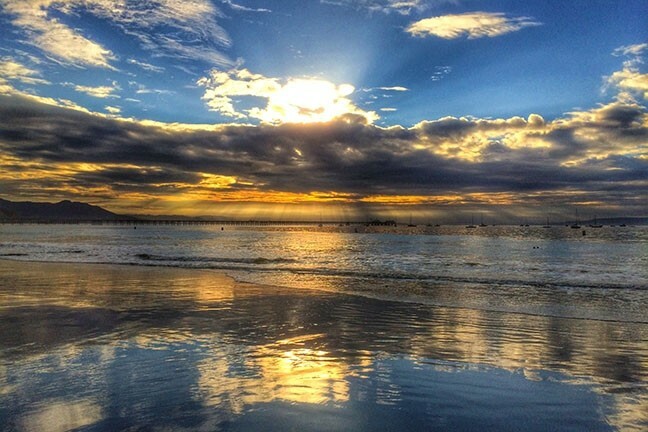 BEACH BEAUTY: Olde Port Beach faces south, meaning sunrise comes up over Avila Beach pier. Our dogs now worn out, my wife and I gather up the trash we collected on our walk and start to haul it up to the trash cans just as a new dog arrives, a chocolate lab puppy, maybe 5 months old, straining at its leash, excited to run on the sand and surf. What a bummer it would be if the next generation of SLO County dogs lost their beach privileges. The harbor district has shelved the dog-ban discussion until the Feb. 9 Property Committee meeting, and depending on what it decides, a proposal may turn up at the Feb. 28 regular meeting. In the meantime, my wife and I plan to work even harder to keep Olde Port clean. Our dogs love it as much as we do.